Crack-Smoking Aside — Does Rob Ford Have a Drunk Driving Problem? What’s the best way describe the state of Rob Ford’s mayoralty in Toronto? At this point, “train wreck” might be too kind. Late last week, news broke that Toronto police were in possession of the famous but elusive video showing the executive of Canada’s largest city smoking crack. The news cycle has, understandably, been dominated by the seedier aspects of this story: Ford’s apparent “double life” and questions about his relationship with Alexander “Sandro” Lisi, who is facing extortion charges for allegedly threatening the two gang members who had the video. As bad as all of it is — amazingly bad — one overlooked revelation could be worse. 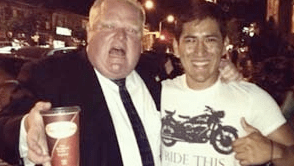 Evidence suggests the SUV-driving, bike lane-hating mayor had a habit of driving drunk. Ford has been able to survive a remarkable scandal-prone tenure (check out this timeline put together by CBC News), and questions about the heavy-drinking mayor’s driving habits are not new. A DWI conviction from 1999 was an early threat to Ford’s first run for mayor. More recently, Ford appeared publicly intoxicated at a street festival this summer, raising the question about whether he was, in fact, drunk when he drove there alone. Ford denied it. If he’s smoking a lot of dope, Ford is breaking possession laws that are observed, in this day and age, mainly in the breach. If his drinking or alleged drug use has caused him to behave in public in ways that run counter to the decorum we expect from elected officials, Ford is abusing the institutions of the office of the mayor and city council, and disgracing himself. But from where I sit, the real crimes occur when his behaviour has the potential to physically or psychologically harm others — i.e., the general public and his family — in ways that aren’t merely political. Imagine if we were all talking about a hit-and-run incident or a traffic fatality instead of a lurid video allegedly showing the mayor stoned out of his tree. Or imagine if the upshot of his excessive drinking was a dead child, struck as the mayor careened through the streets of Toronto in the Escalade that figures so prominently in the court documents. Or say Ford has his own Michael Bryant moment with a cyclist in the wrong place at the wrong time. At that point, no one will care about unpacking his lies and excuses and evasions. By then, it will be too late to do anything but weep. Under pressure yesterday, Rob Ford issued a vague public apology, never admitting to drug use. Lorinc points out that Ford also made some vague references to his need to secure a driver, but didn’t outright admit to driving his SUV around the city drunk. Despite the ongoing disgrace to the mayor’s office and the impending release of the tape, Ford has said he will not resign.
? Train wreck? More like an SUV wreck. When is the election to get rid of drug-addled dangerous-driver Ford? Not until OCTOBER 2014? Can Toronto tolerate this criminal for another YEAR? And now he’s admitted to smoking crack. He denied it until the police actually got the video showing him smoking crack. He’s a liar, a bully, and has a major substance abuse problem. How did he ever become mayor of Toronto? “War on Cars” BS, that’s how. How is Marion Barry still on the DC Council? “war on bikes” is more Ford’s style. Start comparing unsolved hit-and-run bike wrecks with Rob Ford’s known locations before and after and time frame and did he have any physical damage to his vehicle. I find it highly improbable that a man that hates bicyclists as much as he does and has the chemical ingestion problems he has hasn’t already run over at least one cyclist and left the scene. This guy is the poster child for inept, arrogant, abusive, and incompetent governance. Too bad Toronto (according to NPR) has no mechanism for recall. So Ford is saying he only smoked crack because he is frequently in drunken stupors. Really, this is not an excuse. Hey hey — Marion Barry wasn’t driving while intoxicated, so that makes him better than Rob Ford.